When comparing Shauju therapy to other acumoxa methodologies, there are some distinctive differences. One of such differences is the way to assign sho (pattern) and to treat. Most of acupuncture therapies collect a patient's information by the four examinations, and decide which acupuncture points to use. Sometimes, sho　was named after summing up such information in the process. This method can also be seen in Chinese herbology, forming a counterpart of acupuncture in Oriental medicine. Because it is same, you can treat patients either with acupuncture or herbology in the same way. In Chinese herbology, a patient takes the whole prescribed medication according to the condition of the body, that is lead by the information, by mouth at the same time. How about acupuncture, then? If you want to use LI-4, LI-11, GV-14 and GB-20, you can not apply a needle to these points at the same time. So, in which order do you start needling? As a fact can be seen in clinical experiences, the human body changes surprisingly even with one needle. That is, the body often changes a lot, when comparing before and after the first needling. Isn't it a more ideal treatment with less stress to patients, to check changes of the body and perform needling in the most suitable way according to the state of the body each time of needling in each point, rather than to treat after summing up all information of the body in the first place? 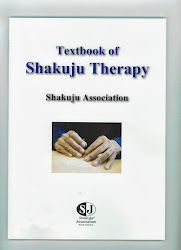 Shakuju therapy is what a therapist always confirms changes of the body each needling, approaching the body gradually from the yang side to the yin side and targeting on the cause of diseases. Following changes that appear in each needling as they are, it makes therapists possible to treat patients regardless of symptoms or names of diseases with acupuncture and moxibustion. This can be said the very Oriental therapy, being different from Western ways, I think.